I’ve resolved to read more classics this year, and that puts me in a bit of a bind. There simply aren’t as many capital-C Classics by women (which does *not* reflect well on our culture), and I’m not that excited to overload on male writers just yet. 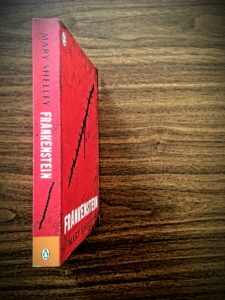 I know this really means that I need to dig a little deeper and search a little harder to find the good stuff, but in the meantime, I have a few on my shelves, including one that I finally bought off of my wishlist last year: Mary Shelley’s Frankenstein. I suspect I should have started with some Jane Austen, because this one was kind of a bummer. An English gentleman ship’s captain, Walton, writes to his sister on voyage from St Petersburg to what he hopes is a sea route to the North Pole and lands further to the east. Stranded by ice, they take on another passenger in a man nearly frozen to death on the ice floe. This man turns out to be another gentleman from Switzerland, who tells his tale to the captain, who in return recounts the story to his sister. The Swiss gentleman is the titular Frankenstein, Victor Frankenstein, a gentleman from Geneva who goes away to study at university, his interests around the edges of science. He discovers a way to reanimate flesh, but the being he creates is so immensely hideous that Victor flees from him. The monster escapes, and Victor makes his way home to Geneva, but only after hearing that his youngest brother has been robbed and murdered. As it turns out, the hideous creation is sentient and sensitive, and if Victor doesn’t provide him with a suitably sentient and grotesque female counterpart, the monster promises to destroy everything and everyone that Victor loves, even if it means pursuing him to the ends of the earth. I just don’t even know what to say about this one. This felt like one of those books where people read way more into it than is really there. It’s repetitive. The “hero” acts like an idiot. The surprises aren’t surprising. It’s impressive to have been written by a 19-year old woman in the 19th Century, but there just isn’t much substance. The narrative voices are too similar. Frankenstein and Walton are rich, spoiled 18th Century dandies that I wanted to slap silly. Everything took several months of stopping by here and there to rest and relax and eat bonbons and recover from the illness of shock. It’s all just ridiculous, melodramatic nonsense. I didn’t enjoy it at all until I started reading it as if it were some campy, hallucinatory fever dream with nested unreliable narrators — Walton imagining the insane Victor imagining the insane Monster — which made it a sort of odd curiosity but still couldn’t make it good. All books are whatever the reader makes of them. Some readers have made a mountain out of this book that seemed barely a mole hill to me. I get that it’s a classic, that entire dissertations, no, careers! have been based on the book’s themes and symbolism. I didn’t find it feminist in any way. I didn’t find it particularly science fiction-y, since the science and fantasy elements were glossed over. I’m sure it’s some elaborate, elegant allegory on I just don’t care what. Or, there’s a simpler explanation. Sometimes, a cigar is just a cigar, and a mediocre book is just a mediocre book, no matter who wrote it or what function in literary history we need it to fulfill. I’m sure I’m not smart enough to “get it”. Or maybe I’m just not into gothic fiction. Them’s the breaks, I guess. I can’t blame you for that. This was another “I wish this book had never come to me” moment. It’s always interesting to hear/read someone else’s perspective on a book that you, yourself, absolutely love. I read FRANKENSTEIN a few years ago for the first time because it was on my list of books to teach for AP Lit. I was surprised by how much I loved it because I’m usually not enamored with the “classics” of literature. I’m also not into gothic literature, which is why I’ve not really been interested in reading NORTHANGER ABBEY despite my love of Austen. I’m right there with you on others’ perspectives. It’s such a curious thing how a book can hook others but not me and vice versa, and even how my own position changes over time. Even in the time since I wrote this review, I’ve softened a bit to where I’m still thinking about the ideas she raised and less bothered by the aspects I disliked. Your mention of Jane Austen reminds me how I really need to read more of her work. I suspect I’d enjoy it and have no good reason why I’ve avoided it for so long.